Trek in the footsteps of legends as we ascend from 9,200 feet to 18,190 feet in elevation, where verdant forested valleys fall away before the icebound drama of the world's highest mountains. Trekking at a moderate pace allows time to acclimatize and to learn about the rich Sherpa culture of the Solu Khumbu region. Explore brilliantly decorated temples and monasteries. Traverse the lower slopes of Tawoche, a 21,463' collection of bare rock, glaciers and towering ice spires. On Kala Patthar, skirt car-sized boulders to reach its 18,190' summit at sunset and enjoy one of the best light shows on earth! Your friendly Nepali staffs provide surprisingly tasty meals while lending support and companionship. Begin and end this epic journey in exotic Kathmandu. Day 01 Arrival in Kathmandu met and transfer to the hotel. The afternoon is left open to rest and explore. Perhaps, take a walking tour with your self and explore the tourist streets of busy Kathmandu. Day 02 Enjoy a Full -day guided tour of the ancient cities of Kathmandu and Patan. Visit Swoyambhunath, the Monkey Temple, Bouddhanath Stupa and Jawlakel, a Tibetan refugee carpet center. Day 03 Early morning (7 a.m.) transfer to the airport to catch our scenic flight to Lukla (9,200'). While having lunch, the supplies and our gear are loaded onto yaks or porters. The trek begins with a 3-hour hike down through terraced hillsides to the Dudh Koshi River (8,600'), across a hanging bridge, to our first camp in the Solo Khumbu region. Day 04 The dawn's air is crisp as the sun won't reach the bottom of the Dudh Koshi Valley until mid-morning. 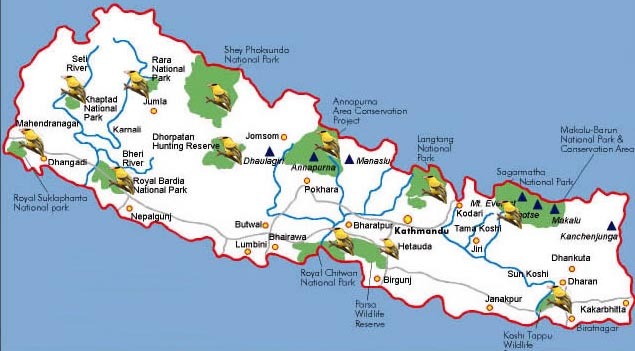 Today, the trail wanders through rolling terrain, past traditional homes and plowed fields and slowly ascends to the entrance of Sagarmatha National Park. An early lunch provides fuel for the steep 1,800' hike to the village of Namche Bazaar (11,300'). Namche is the largest Sherpa village and has been the primary staging area for major expeditions. REI has a long history here and has cultivated many Sherpa friends. We are likely to have the opportunity for a Sherpa home-stay this evening. Day 06 Leaving Namche Bazaar, our trek steps off the standard Base Camp trail for the next two days. We ascend up past the Syangboche airstrip (12,200) and down into the small hidden valley of Khumjung. Khumjung has the most important school and the only hospital in the Khumbu region … both were built by Sir Edmund Hillary. Crossing the valley we ascend through a rhododendron forest, traversing the beautiful southern slope of Khumbila, the holy mountain of the Sherpas. We should reach Moung La pass (12, 992') and our camp in mid-afternoon. The setting is absolutely spectacular. Watch for impeyan pheasants, tahr mountain goats and possibly musk deer when walking through the forests. Day 07 Today is another acclimatization day in that we end the day sleeping at the same altitude as last night. Descend rapidly 800' to cross over the roaring river fed by the glaciers of the 10th highest peak in the world, Cho Oyo. We pass through the village of Phortse and enjoy a fairly gentle ascent to Pangboche Monastery (13,030'), the oldest monastery in the Everest region. Sitting among the 400 year old juniper trees, gaze across the valley at the magnificent Ama Dablam (22,420'). Day 08 This is a long day with the toughest section coming right at the end as we ascend 1100' to Dingboche (14,400'). In the afternoon, our trail swings off the main track to the east and climbs slowly up to the windswept potato fields of Dingboche village, the highest permanent Sherpa settlement in the region. Ama Dablam's razor edges are particularly dramatic here. Note: We take the lower trail to Pheriche (13,900') if health or weather makes this a more prudent choice. Day 10 Ascend gently through alpine scrub and yak pastures to Loboche (16,269'). 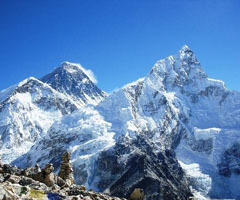 The scenery becomes more and more stunning, with views of Tawoche (21,463'), Cholotse (21,128'), Ama Dablam, Nuptse, Lhotse', Lhotse Shar' and a host of "lesser" peaks. We pass fewer and fewer trekkers the further into the interior we go. As has been true throughout the trek, it is imperative to be drinking lots of water and staying well hydrated at this altitude. Day 11 Enjoy a relaxing morning before a 3-hour trek up to Gorek Shep (17,100'). This tiny "village" consists of a couple of small stone huts residing in the shadow of Kala Patar Ri (18,190'). We arrive about 1 p.m., set camp, have lunch and load up our packs with warm clothes and a flashlight. Head out for the summit of Kala Patar around 3 p.m. to arrive at the summit by 5:00p.m. We don our warm clothes and get ready for the best light show on earth… a sunset that defies description! Descend to dinner. Day 14 Full day of trekking, but easy going as it is mostly downhill and the air continues to become more oxygen-rich. Camp near Tengboche Monastery (12,761'), the impressive main temple for Tibetan Buddhism in the Khumbu region. Day 15 A dusty day's hike with a long descent to the Imja Khola followed by a long ascent on the other side of the river. We return to Namche Bazaar for the evening. Sherpas love a good party, and after many days on the trail, a celebratory farewell party is planned for the evening..
Day 16 Trek down from Namche Bazaar to Lukla (10 miles) leaving the snowcapped peaks behind and carrying with you the unforgettable memories of an awesome journey. Overnight in Lukla. Day 17 Very early morning preparation and return flight to Kathmandu. We are met by our ground staff and transferred to our hotel for hot showers, clean clothes and a relaxed day. The balance of the day is free time. Day 18 Free day and sightseeing. This day is on your own, but we provide lots of hints about what to see and do. Breakfast is included. Days 19 Free day and shopping in Kathmandu. Day -20 we transfer to the airport for Namaste flights departure your homeward journey. Note about flights: Most treks run during the best weather conditions of the year and there is an extra day at the end of the trek to allow for poor weather, sightseeing and shopping. Flights to and from Lukla are not always dependable; weather conditions may cause flight cancellations. Costs of any evacuation are in addition to any previously paid air/land costs and are billed to trip members upon return to the States; thus we highly recommend the purchase of Trip Insurance.